Class is back in session, Perception fans, meaning Dr. Daniel Pierce has more lectures and another murder case is in need of solving. 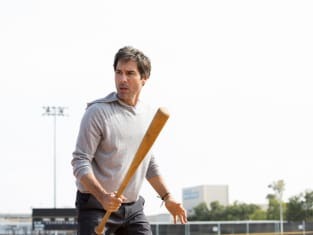 It feels like ages since Perception Season 2 Episode 10, but “Curveball” was indeed a midseason premiere and continuation of Perception Season 2. And nothing quite like twins and baseball to get the series back into the swing of things. The case itself was decent, as was the concept of a double life and the question of having the perfect life. I liked that the story diverted from a potential case against an autistic boy who loved trains and accidentally murdered someone to a switcheroo between long lost brothers. I had a feeling the two brothers were going to trade places, so I wasn’t really surprised with the reveal. That said, it’s fun watching Daniel figure out all the details and clues in his head. Do his hallucinations still spell out certain points him? Sure, but I’m definitely more used to the concept that those hallucinations are mainly a way for him to think out his process out loud and for the audience to understand what he’s doing. It did seem a bit too easy to get the brother to admit the entire story at the end, but I understood that he was supposed to have a certain ego about him and belief that he could have been the best. However, it was the goofy character moments outside of the case that brought a lighter fun fare to the hour. Having Lewicki try and show the prodigy around campus only for it to end up with the prospective student getting high, or the Dean sleeping with the mother? It’s silly and a far cry from the extremely scientific aspects of the show, but it’s a good step in trying to add something to the characters involved. Even the brief moments of Donnie and Kate trying to catch a meal together further established their rekindling of a possible romance. Plus, bringing a six-pack of Blue Moon beer is probably the right move to smooth things over after all the missed dinners. Which makes Daniel’s ending commentary on twins, the brain and ultimately the importance of relationships that much more meaningful to the specific plot of the hour but also the show’s attempts at being more than just a procedural with a main character that hallucinates various people. Perception Season 2 Episode 11 wasn’t a home run for its return, but it was a positive and fun dive back into the show. Should Donnie and Kate get back together? Yes. Those two should try again. No. They should just be friends.